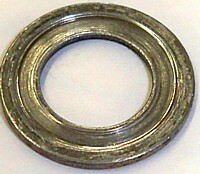 A gasketed joint leaks when imperfections in the joint are beyond the capabilities of the gasket, in which case replacing the gasket may not fix the problem. Joint problems are often revealed in the gasket. Gaskets tell a story about sealing surfaces, but all too often they are discarded without giving them a chance to tell their story. Whenever joints come together the contact (faying) surfaces conform and the joint functions properly; or joints can leak, move about, loosen, wear, and cause problems. Gaskets, and washers acting as gaskets, seal by embeding into imperfections in the faying surfaces -- to a point. You can prevent problems by inspecting gaskets and surfaces to see how they are doing. The spark plug gasket above was leaking at the upper right hand corner. I would suspect that the sealing surface on the cylinder is damaged and leakage may continue even with a new gasket. Close monitoring for leakage after a test run and for the first few operations would be prudent. A leaking spark plug gasket interrupts the heat path causing the spark plug to operate hotter and possibly cause pre-ignition. Gas leakage also erodes the boss resulting in even more leakage if not corrected. Spark Plug Gasket - Deformed from excessive torque. Damaged surfaces -- scrapes, gouges, erosion, pitting, etc. Faying surfaces not pulled tight leaving gap.